Hi, its me Virginger posting today for Squillion Day. Now lots of you have loving homes throughout the blogosphere, we even adopted Flurries a few months ago from the vSquillion Shelter. Flurries and I get along just fine and had no problem adjusting to each other. Well, we are girls, that might make a huge difference. The boys are having a time out for the day, mum gives them a little time together, then they spend time apart. Ducky is a cutie pie in my mind and Derby will just have to get used to him! He will in time, so will Ducky adjust to the place. Mum keeps a pretty close eye on him. He hasn't been allowed to go into the dungeon yet either. 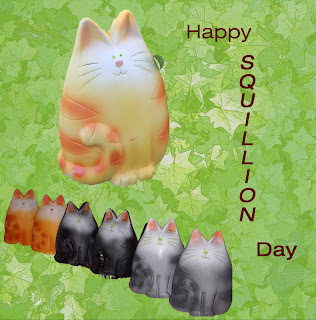 Happy Sunday, Happy Squillion Day! Well after I chased the runt around tonight, mum let him have the big living room to himself for a bit. The she put him back into quarantine, now I can snooze in peace. Hey, its Ducky! Big kittie is being mean, but the lady is making sure that he doesn't get carried away. I like sort of like the quiet times too, just me and the lady. Mum let the little runt out of his quarentine tonight and let him wander around the main part of the house. I pretty much stay on him the whole time, chasing and wrassling with him. At one point I made him yelp, them mum put him back into the sleepy room. Now I have mum to myself on the couch. But I am sure she will go and spend time with him tonight and watch 'Lympics. Last night Mum has us together for about an hour in the sleepy room. Since we didn't have as much room not much chasing, but lots of wrassling. I even ate his foods for him since he still had crunchies in his bowl. Mum did finish her knitting project the other night, but still has to finish off all of the ends on the back side where the color changes. Hey that little runt is all over the place, this is my blog, my picture should be here. Yeah, my life is upside down these days! Yeah I have a brofur now. Ducky mum calls him. QUACK! QUACK! QUACK!. He makes all sort of squeaks, chirps and such, mum says he purrs lots. Caturday mum did a bunch of running around, then when she got home she got my porch out and I went inside. Then she let the little runt cruise around the rest of the house while I had to watch. Finally she took the squirt back into her sleepy spot, but then she put me in the carrier and took me into that room, then let me out! So we sort of got along for a bit, but mum didn't let us be together for very long. Caturday night she got us together again, that little twerp went for my throat! So I went back at him. Sunday mum brought him out and put him in the porch while she used the sucking monster. I collapsed the porch on top of him, hehehe. He is now back in quarantine. He is a bit of a strange duck! He plays with his Greenies treats before he eats them. He does that around me I will eat them on him. So here is a moovie with him. The the lady has left me alone, but this left this machine thing here. I see all sort of other kitties here, so hello to all of you. I was Briggs at the shelter, but the lady wanted a name that would go together with the other kittie here, so now I am Ducky. 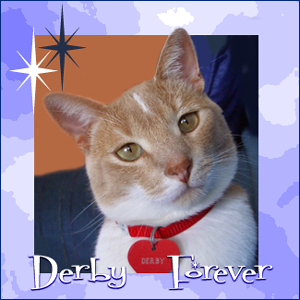 I haven't had much face to face time yet with the big kittie, the lady calls him Derby. He has meowed at times from the other side of the door, and I caught a quick glimpse of him as mum whisked me into the house and this morning we met as the lady opened a door. She let us sniff for a minute or so. Otherwise she has kept us apart. I am a cuddly little guy, soft tummy that is hard to resist and I love getting snuggles, scritches, pets and tummy rubs. The lady has been spending lots of time with me in her sleepy room, so I have been nice and taken a few long naps with her. The lady has been nice to give me lots of tummy rubs, she can't resist. The first night I has here, I jumped up and parked my self on top of her legs. To heck with watching them people playing in the snow. Play with me! I even had a short side trip to visit a place where they gave me the once over from head to toe. The man in the white coat said I was a pretty little guy, healthy and ready to roll. I even purred real nice for him. Oh, I think the lady is coming back, gotta go for now. More later if and when I can. The final tally is in for the long weekend. Mum had stuff to do so we didn't have lots and lots of time to watch with me, but this is what we saw and will report. This is average for a weekend. We ususally see more woodypecker guys and cardinals, a nuthatch or two, but these guys we always see. Hope that you were able to pawticipate too. Otherwise remember for next year. Plus a big shout out to mum, she is getting officially older today. So happy day mum, enjoy, even if you are off day hunting. Some of her furiends sent her a really cute card with a ginger boy on the front. Will this work for my cute expression? I hope so. I was in sun and shadow and we had lots and lots of sun this weekend to nap in. Mum says we really can tell the days are getting longer. In other new, I think something is up. Mum has shut me out of her sleepy spot since Saturday. Plus she spent a lot of time in that room and not just sleeping. She took her pile of "I gotta read these magazines" with her. I sit at the door an called to her, but she won't open the door. Even when Grampie came to visit on Sunday, he got to go in her sleepy spot for a while. I heard them talking, but they wouldn't let me in then either. Then they came out and mum watched part of the CrashCar race, readed her newsy paper and such, counted birdies with me too. Then she made some dinner for Grampie and took him home. Then got to see the end of the crashcar race. Then some of the 'Lympics and then off to the sleepy room early again! Stay tuned, plus I get a mum day today, she doesn't have to work on President's Day but say she has stuff to do away from home. To all of you who have birdies outside your windows, and who doesn't. This weekend is the Great Backyard Bird Count. All they ask for is at least 15 minutes of watching and counting the fevvers of wherever you are. Home, work, school. They use this to see where birdies are and how their habitats and habits are changing. The more data the better the study. Mum and I did this for the first time in 2007, and then we also got hooked up with Project Feeder Watch, which we now do every weekend, all winter long. Here I am sitting on my pillow waiting for birdies to come by. This was on our snowy day so I didn't see much but snow. Here is a picture that mum took of the back yard before she walked all around to clear the snow from the roof and patio. With the drifts in places it was between mid-calf to knee high with snow. But with the sunny day, things are clear and dry so mum can get around easy. Thanks to Simba and The Crew for sending this award along to me, what a sweet thing to do! Copy the image to your blog. 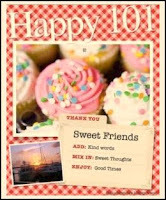 List 10 things that make you happy and try to do one today. 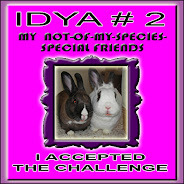 It is hard to choose, so everybody who hasn't received this award yet can consider themselves chosen! In other news mum is falling asleep on the couch. She got up furry early today and used the snow eating monster, then went off day hunting. She came home a little early from day hunting and was using the snow eating monster some more. Then the snow eating monster just stopped working! So mum was clearing the snow by hand, at least enough to get the metal monster into its room. But then she loaded the snow eater into the metal monster and took off! She came back a little later and the snow eater was working again! No it had gasoline and all, but a small rock, mum thinks a piece of ashphalt from the street, got caught in the flapper thingy. The guy at the fix it shop, had it out in just a minute and sent mum home. The didn't even charge her for it. But it is still snowing, so mum will have to get up early tomorrow to keep moving the snow away. Mum says it could be worse, Uncle Flip in Marry-land had 27 inches of snow over the weekend and they are getting more tonight. Hope everycat and bean had a good weekend. We have been getting some strange comments in the past week. Lots from one particular non-kittie blog type. If we follow the link back it goes to a suspended page. So I had mum tighten up the comment moderation time and if this goes on I may have to go to total comment moderation which mum says will be a bit more work, but not as much fun as you won't see the other comments ahead of you if mum hasn't had the chance to check the comments out first. Mum also has made it so no anonymouse comments too, so I hope none of you have issues leaving a comment. Hope all my furiends out east are OK with all the snow. Uncle Flip lives out there, so he got lots of snow. On Friday he emailed mum and the rest of the family, said he had enough food, drink (alcohol), dry firewood, books to read. So he was all set to hunker down for the duration of the storm. Then he would dig out when it was done. I also hope none of my furiends out in Connect-a-Dot had any one hurt in the explosion there at the power plant. I spent most of my Sunday over at Gracie's for the Stouper Bowl Party. Olive and Opus came by to pick me up in the MFV and brought a blue wig for me to wear too. The New Orlean Saints are Stouper Bowl Champs. I was hoping The Colts would win, but it was a good game. Not really decided until the 4th quarter, not a blow out by one team or another. The game for a change was better than the commercials. Mum favorite commercial was The Dorito ones, mostly the first one with the fake dead guy, mine was the Dockers commercial coming right after the tighty whitey guys, which was rather strange. Now mum says it will be time for CrashCar to start up, that means we can nap on Sunday afternoons. The day is here! 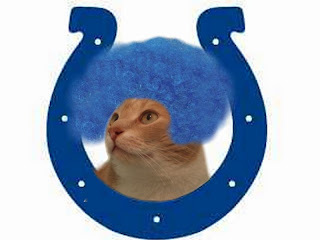 Go Colts! Mum said she won't be watching much until the actual game time gets closer. Says she doesn't need to be brain dead by the time the actual game starts. She will be doing the laundry and such until then. Olive sent along an extra Colt Blue wig to wear. HEHEHEH, it tickles my ears! Olive and Opus are here to pick me up to go to Gracie's for the party. 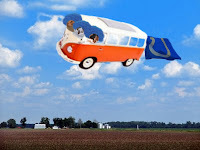 I haven't ever ridden in the Magic Flying Van (MFV)before. We are going to have fun today. 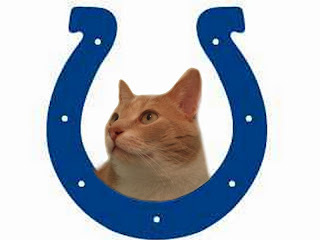 May the best team (The Colts) win! Bye mum, be back after the game! Yep we have made it to the weekend. Stouper Bowl weekend. 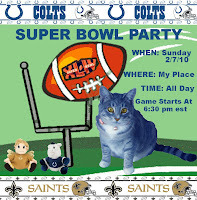 I will be dropping by Gracie's party for a bit, but mum says she will be just watching the game. No multi-tasking and being on the puter at the same time. She wants to really watch the game cuz she thinks it will be a good game. The mum day yesterday was nice. Firsted, mum actually slept in! She didn't get out of the sleepy spot until after 8 AM. Then she sat around in her jammies reading the paper and doing a few things on the puter, had breakfast and THEN actually got dressed. Then she was gone for a little bit, said she went looking for a thingy that will make our water softer. What? Our water is soft, unless you freeze it, then it is hard. Mum says that isn't what hard water is, hard water has more minerals in it. Sure OK, whatever mum. Also she went and found a new machine to wash our dishes, but it has to get here and then be installed. To all of you who have birdies outside your windows, and who doesn't. Next weekend is the Great Backyard Bird Count. Mum and I did this for the first time in 2007, and then we also got hooked up with Project Feeder Watch, which we now do every weekend, all winter long. But for Feeder Watch we just report on what is in our yard, not what mum sees all over the place. William got me started on this back in 2007, thanks William, mum and I enjoy this. I hope that more kitties and their beans will join in. Mum also worked on the blankie, me I attacked the yarn! OK, mum is bugging me, cuz I keep bugging her and puting the bitey on her hand. She says I am being too sassy for her tonight. Hmph, that is what I am, SASSY! Mum checked the shelter website tonight. Opal isn't listed any more, woohoo, she is off to her furever home. Enjoy your new life Opal. I got the remote so can we watch what I want for a change? Sure, as long I can turn it on and change the channels myself. Lot of good that does me, I don't have thumbs! Mum saw this TV listing for dinner in Emelia Romagna, that is where Opus and Olive live with there beans. Oh and I got these shades from The Hotties along with a duck as a prezzie from their Christmouse Eve Party. Mum put them on me, I walked under the cord to get it off. Mum looks better with the shades on than I do! Plus I get a mum day on Thursday, woohoo. I am always doing something. Napping, eating, playing, just hanging out with mum. Just because I can't do 'chores' like a bean can, doesn't mean I am doing 'nothing'. Just like the video, some beans might say I am doing nothing. Not really, working on my love paws and purring up a storm. Mum was cruising my shelter's website on Caturday and we saw the following. My Princess is up for adoption? Mum said no, that is not MY Princess Mia. I said are you sure, she said yes. Mum even wented out to see my shelter this weekend. Most of the addition and remodeling is done and she says she likes it and I would too. The kittie area is now at the front of the building with lots of windows so we kitties would get natural light. The area straight ahead is the big kittie play room for beans to interact with kitties before they adopt. I think they let them out to play during non viewing hours too. They have big windows that go to the floor to see outside. Mum didn't take many pictures inside as there was lots of beans around. Mum says the crates are bigger than they used to have, plus big picture window suites for like a family of cats that come in or a bunch of kittens if they have them. They have a big sign out front about going to The Bridge, but they call it the Rainbow Valley. Mum got all leaky eyed when she read the story off the picture when she got home. Plus mum donated some green papers to help build the new place, and she bought a brick. So she looked and found it right away. It is near the corner where the sidewalk by the parking spaces meets the main walkway into the door. A nice prominent spot! But mum cheated on me. She looked a at kitties, says maybe it is time I had a fursib. So the kittie she looked at was Opal, who was listed right above Princess Mia . Why Opal? Well mum says to be fair, since I have no claws that my fursib not have claws either. Not many kitties come in like that and Opal is a all four de-clawed kittie. Here is a short video, mum says she is really quiet, maybe too quiet to deal with me. Mum said her one eye is all wonky too, her right eye. Sort of looks like a cataract in the eye. They said they don't really know what is wrong, it is not a foreign body and she is being treated by the vet. She sat quietly under the chair for a while. Mum tried to get her to play and she really didn't want to play. Here she is looking out the door into the room with the crates with all of her fellow kitties waiting for adoption. Guess I better enjoy my days as a only cat, they may be numbered! Derby's Mum: Opal was very sweet, sort of liked being cuddled but wouldn't play much. She has been in a foster situation with other cats and did ok, but what sold me on Derby was that the minute we were in one of these little rooms he came over and rubbed up against me and meowed hello. We played and had a great time. Opal was content to sit, mostly under the chair. She was soft and sweet, so she will find a good home soon.